U.S. 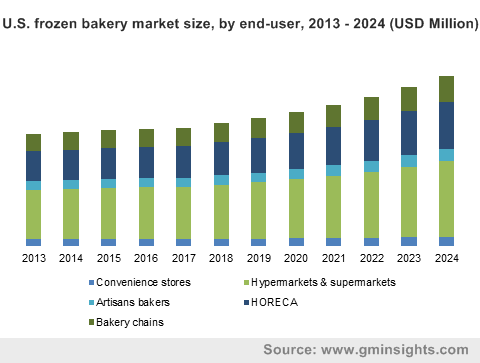 Frozen Bakery Market size was more than USD 6 billion in 2017 and will witness 4.3% CAGR during the forecast timespan. 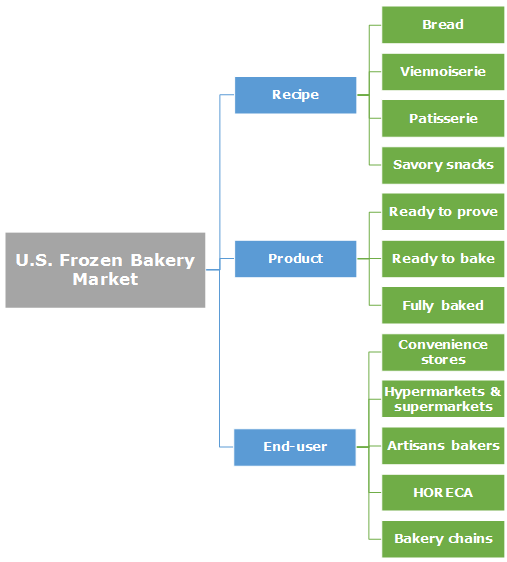 U.S. frozen bakery market will be primarily driven by the rising demand for ready to eat and convenience food market in the country. The globalization of eating habits does not mean a narrowing of market opportunities, rather it means that a wider variety of foods will be sold and consumed in a wider variety of places. Thus, creating ample growth avenues for the product. Furthermore, high per capita income and busy lifestyle of consumers have substantially driven demand for ready to eat food products in the U.S. in past few years and shall continue to do in the coming years. This will positively influence frozen bakery market demand over the forecast duration. Rising disposable income also increases demand for variety in food while prices become less important. As per capita income rises, people travel more and explore new food cuisines. Food processing companies are responding to these developments by introducing new products. Moreover, restaurant business also contributes significantly in the frozen food market growth. In 2016, the total food & beverages sale from restaurant business was approximately USD 766 billion. Additionally, the quick service restaurants industry was valued at USD 198 billion in 2014 in the U.S., which is likely to grow substantially in the coming years and eventually will propel frozen bakery demand from 2018 to 2024. The frozen bakery market is primarily driven by substantial participation of women in the U.S. workforce and a rising number of households with nuclear families. As ready to bake and fully baked food items require a very little preparation, these offer a convenient solution to people juggling between hectic work schedules. In recent decades, gradual changes have been occurring in the socioeconomic environment and the demographic structure of the U.S. population. These changes along with technological advancements in farming and marketing, have substantially influenced frozen food consumption habits of consumers. Changing food consumption patterns as well as emerging sources of food supply are impacting the entire food industry, which will be ultimately influencing the frozen bakery products market. However, massive obese population along with drifting consumer focus towards nutritious diet shall hamper bakery product demand in the U.S. Bread segment of the U.S. frozen bakery market will be witnessing promising gains during the forecast period. This can be attributed to the high demand of frozen dough for making breads, which can be used for making endless variety of bakery products. Bread is an integral component for many of the main desserts and other bakery items. The growing bread consumption in the U.S. will be driving frozen dough demand in the coming years, thus positively influencing frozen bakery market over the forecast period. Patisserie includes all types of pastries and cakes. The segment shall witness moderate growth rate during the forecast period. Pastries and cakes are integral part of any celebration, be it birthdays, weddings, anniversaries, parties or any such special occasions. The patisserie segment has witnessed entry of some of big baking companies in recent times owing to the rising demand for fancy and decorative cakes and pastries in the market. This will positively influence frozen bakery demand over the forecast timeframe. Widespread importance on the morning meal will spur the demand for packaged breakfast baked products, which includes bagels, donuts, croissants and muffins. Rising demand for portability and convenience food are some of the major driving forces influencing this market. Ready to bake segment held the largest share in the U.S. frozen bakery market in 2017 and shall remain in the same position by 2024. Ready to bake products save time of consumers in making the ingredients mixture and since they are in perfect composition, the chances of successful baking rise substantially. Hotels, restaurants and caterers’ segment will witness highest CAGR in U.S. frozen bakery market during the forecast timeframe. This segment also includes quick service restaurants, which is poised to experience a prominent growth rate in the U.S. during the forecast period. Quick service restaurants have become popular in the U.S., especially the food trucks culture has gained American attention to a great extent. These restaurants mostly have recipes that can be prepared under 30 minutes, which attracts a large pool of consumers who are always in hurry and prefer eating while walking. This positive attitude of consumers towards quick service restaurants will ultimately be beneficial for frozen bakery market size over the forecast timespan. The U.S. frozen bakery market is highly competitive with presence of companies such as Grupo Bimbo, Flower Foods, Tyson Foods Inc., Custom Foods Inc., Clabber Girl Corporation and Guttenplan's Frozen Dough, Inc. These companies have been operating in the frozen bakery market since decades and have consumer trust and loyalty for their premium brand from a very long time. Moreover, these companies have long-term supply contracts with hotel chains, restaurants and catering services, which lets them have a larger customer base. Most of the frozen bakery manufacturers are working as a distributor. This industry has a high scope for forward integration. Distributors in the industry play a vital role in the frozen bakery market. Most of the companies are having their own distribution network and they also distribute the products through third party distributors. U.S. frozen bakery market will be primarily driven by hotels, restaurants and catering services market growth in the coming years. Hypermarkets & supermarkets will be witnessing prominent CAGR during the forecast timeframe. Frozen bakery food is gaining prominence among consumers due to its ease of baking and convenience food, which shall be a prime buying factor for consumers in the coming years. Rapidly growing hotel chains business in the U.S. will be a major factor fueling frozen bakery market demand over the forecast timeframe. Hotel and large-scale restaurants prefer frozen dough as there is always need for quick service, which demands readymade doughs to be quickly used for preparing desired food dishes and bakery items. Additionally, growing popularity of convenience food will be fueling frozen bakery market demand during the forecast timespan.